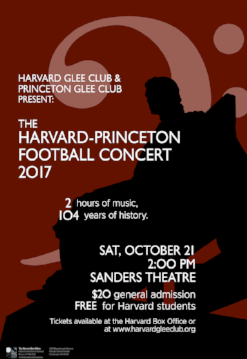 The 104th Annual Harvard-Princeton Football Concert was held on Saturday, October 21 at 2 PM in historic Sanders Theatre after Friday’s big game. The groups performed a variety of choral works, from Renaissance polyphony to American spiritual, from sacred Russian hymn to contemporary works and popular tunes. The concert culminated with a rousing rendition of Harvard’s fight songs. This was the Glee Club’s first concert of the 2017-18 season! Click HERE to view the concert program!